In his new “financial history of the world” a historian famous for celebrating empire turns to praise the wonders of capital. Published in the Spring 2009 issue of Dissent. Nestled in the acknowledgments at the end of Niall Ferguson’s new “financial history of the world” lies a sentence that is as remarkable as it is nonchalant. “Like my last three books,” the historian writes, “The Ascent of Money was from its earliest inception a television series as well as a book.” He goes on to express gratitude to collaborators at both Great Britain’s Channel 4 and America’s PBS. This is a gracious and appropriate thing to do. Given that few other academics on the planet would ever need to offer such thanks, it is also an indication of the extraordinarily charmed career that the still-young professor has led thus far. At the age of forty-four, the Scottish-born Ferguson holds joint appointments in Harvard’s history department and at its business school. He is a senior fellow of Jesus College, Oxford, and a senior fellow of the Hoover Institution, too. 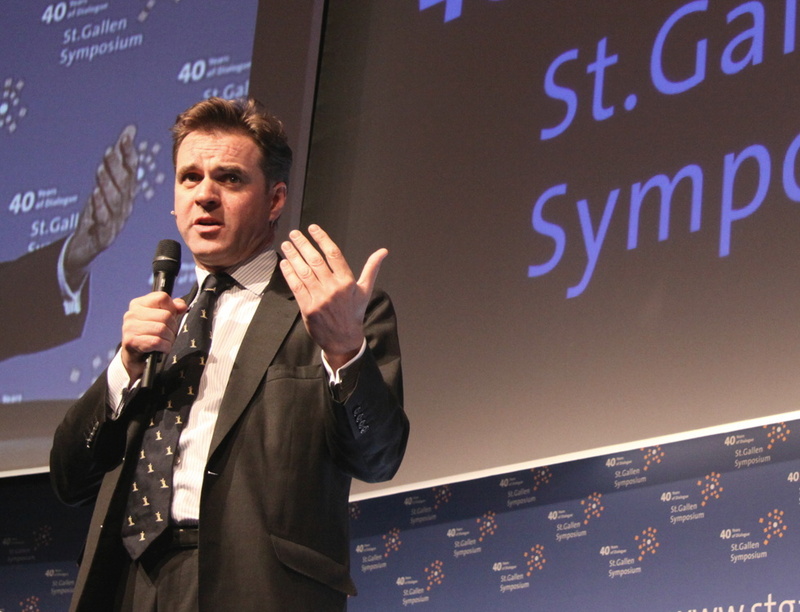 He regularly appears as a commentator in magazines and newspapers on both sides of the Atlantic, and he has been named by Time as one of the “100 most influential people in the world today.” Add in his books and those recurrent mini-series on public television and the coup is complete: Niall Ferguson is everywhere. As his prominence as a well-chaired professor has grown, so has his political influence. He is known for his writing on empire and on international finance, two topics of particular concern to progressive historians and political economists. Ferguson, however, is irrefutably a man of the right. And it is the interaction of his high academic standing, his distinct brand of conservatism, and his omnipresence as a public intellectual that makes him an important, if troubling, personality to comprehend. By the early 1990s, Ferguson’s drive had carried him far. While moonlighting as a journalist writing under pseudonyms for publications in England and Germany, he had moved between a series of research fellowships and established himself as a leading scholar of the German financial system with his doctoral dissertation. This was published in 1995 as a book entitled Paper and Iron. By that year, Ferguson had returned to Oxford as a fellow and a tutor, well on his way to a full professorship. Ferguson’s rapid rise was capped by the 1998 publication of The House of Rothschild. The book, a distinguished treatment of the famous banking dynasty, remains Ferguson’s most lauded work. It is widely regarded as a brilliantly told story of how the family’s control of the bond market shaped the course of European empires. The same year, Ferguson published The Pity of War, a controversial reappraisal of World War I that established both his contrarian instincts and his taste for the theatrical. He argued there that the human and financial cost of Britain’s entering the conflict was too high, and that it needlessly escalated what could have remained a contained, regional dispute. The book aggravated those who defended the patriotic virtue of “The Great War.” In contrast, many left-of-center critics who would later come to revile Ferguson regarded it as a welcome piece of mainstream historical revisionism. Probably more significant than the views of either camp, the book sold very well, further moving Ferguson into the limelight as a public intellectual. The book highlighted certain tendencies, however, that would cause Ferguson to start losing the respect of his fellow professional historians. The Pity of War‘s premise—the question “What if Britain had never entered the conflict?”—is an example of what historians call a “counterfactual.” Ferguson is now known as a leading promoter of the counterfactual method. He edited a volume of these “virtual histories,” with essays exploring other hypothetical scenarios such as, “What if John F. Kennedy had lived?” and “What if Nazi Germany had defeated the Soviet Union?” These type of questions have a certain popular appeal. By and large, however, academic historians see counterfactual history as hopelessly speculative and laden with biases; various academics have described the method as a “parlor game,” a “red herring,” or even (as E.P. Thompson famously remarked) “geschichtswissenschlopf”—unhistorical crap. Some charge that Ferguson’s academic critics are merely driven by envy. In addition to being sharp-witted, Ferguson is handsome, telegenic, and self-assured. But, as he has increasingly morphed into a media figure, he has engaged in some curiously overt image-making. His films show him gazing at baroque palaces, climbing over ancient ruins, surveying quickly passing landscapes from aboard historic railways, and standing intently on the sidelines as military processions trudge past. He is rarely absent from the unfolding drama. In War of the World, a recent miniseries, he is pictured in the same costume—a tan suit and an open-collared powder-blue shirt—in all parts of the world, as if teleported from scene to scene to offer sage commentary. Whatever one makes of Ferguson’s forays into the popularization of history, it is clear that his arguments became less and less designed to be judged on academic terms. In the case of what would emerge as his most notorious contentions, they became unabashedly political. If these notions have a familiar ring, it is because they struck a welcome chord with the neoconservatives ascending in the U.S. foreign policy establishment at precisely the time Ferguson was laying out his theses. The historian’s work lent academic heft and credibility to the political arguments being forwarded by the likes of Richard Perle and William Kristol. He became the toast of Republican Washington. Kenya’s is not the sole problematic history. India was a relatively wealthy country when Britain arrived and a poor one when it left. Britain’s supposed gift to India, a system of modern railways and telegraph lines, was used to exploit the colony all the more efficiently. In the late 1800s, during times of crop failure, Hari observed, this exploitation led to the mass starvation of some twenty-nine million people. Hari’s attack provoked a heated public exchange of letters. Like all the best intellectual feuds, it involved name-calling, with Ferguson dubbing his detractor “Horrible Hari,” after a series of children’s books by Terry Deary. By way of self-defense Ferguson acknowledged, as he had in his books, that the record of empire was hardly unblemished. Then, also as in his books, he went on to downplay imperial atrocities and to defend Britain’s nobler motives. In short, he argued that it was irresponsible to compare British crimes with those of Stalin and Hitler; the British may have been guilty of “incompetence, negligence and indifference” but not “willful genocide.” Besides, Ferguson posited, the British were more benign than other conquerers to which the colonized might have been subjected. Similarly, historian Timothy Burke concludes, “Ferguson simply ignores a generation of historians outright, as if they never existed.” This generation, not coincidentally, has produced “an absolutely gigantic body of careful, historically precise scholarship” that reinforces a view of British Empire opposite of that which Ferguson aims to uphold. One can be pardoned for having the impression that Ferguson did more than merely fail to oppose the war. Colossus is littered with sentences like “never was the case for war so convincingly made” and “[t]here were many legitimate reasons for a UN-authorized war against Saddam Hussein—almost too many.” He argues that the United States should have been more aggressive, willing to shed its “imperial denial,” to send in more troops and more administrators and to remain for a longer period of time—likely for several decades. It is not clear that any of this qualifies Ferguson as an early voice of caution. The author himself seems to recognize that he is on weak ground. In an interview with Wallace-Wells, he admitted that Colossus was “vulnerable to attack,” and he characterized his works on empire as “edutainment at best.” These are rare sentiments indeed for a public figure to express in an on-the-record interview. Today, the neocon moment has clearly passed, and Ferguson, too, has moved on—just in time, it turns out, for the greatest financial crisis in three-quarters of a century. Having written several sweeping works that relied almost wholly on secondary sources, Ferguson gave some indication in interviews after Colossus that he would go back to financial history and to doing original archival research. That did not happen. Instead, with The Ascent of Money, the historian offers the edutainment version of the rise of capital. The book’s argument is that “money is the root of most progress” and that “[b]ehind each great historical phenomenon there lies a financial secret.” Tracing the history of banking credit, bonds, stocks, insurance, and the real estate market, Ferguson covers a wide swath of material. In his typically contrarian fashion, he provides interesting arguments that the Confederacy’s fall had as much to do with its inability to secure external financing as with its manpower shortages or battlefield defeats, and that Nathan Rothschild had a critical, if little appreciated, role in Napoleon’s loss at Waterloo. He relates how the bond market arose from the state’s need for money to go to war, and how modern insurance evolved from a fund for the widows of pastors in the Church of Scotland. There is much here that makes for entertaining reading. Yet, especially as he addresses events in the relatively recent past, Ferguson hits enough sour notes to give the impression that he is trading on his status as an acclaimed historian to give weight to arguments that regularly fail to rise above the predictable biases of conservative punditry. Considering current economic circumstances, few writers would be inclined to use the words “ascent” and “money” in the same sentence. Ferguson is not unaware of the problem. Like with his stance on Iraq, he wants it both ways. On the one hand, he would like us to believe that his command of history allowed him to predict today’s financial woes. He tells of a speech he gave to a business audience in November 2006 in which he argued that “it would not take much to cause a drastic decline in the liquidity… and that we should be cautious about expecting the good times to last indefinitely.” On the other hand, Ferguson stands so resolutely in awe of the market’s power to do good that it is doubtful he would dare impede its advance with any real regulation. The Ascent of Money speaks to a long list of scammers, con artists, and irresponsible gamblers—from John Law, the devious Scottish schemer who succeeded in creating a stock market bubble in eighteenth-century France big enough to imperil the monarchy, to more contemporary shysters such as the executives at Enron. However, Ferguson refuses to draw any real morals from their stories. It seems as if the bad apples are there only for color, because the historian does not admit that they indict the system itself. Those who might do anything about the market’s destructive excesses are ignored or derided in The Ascent of Money. When Ferguson mentions labor unions, they appear only as sources of economic inefficiency—as in the period after World War I, when the “increased power of organized labor” made it “harder for employers to cut wages in response to price falls,” thus helping to bring about the economic turmoil of the 1930s. Likewise, although Ferguson is plenty familiar with Keynes, he accepts the neoliberal idea that Keynesianism had profoundly and irreversibly failed by the 1970s. When he writes on the twentieth century, Ferguson’s book might have more accurately been subtitled “a monetarist history of the world.” He is entirely convinced by Milton Friedman’s explanation of the Great Depression, crediting the economist with “perhaps the most important work of American economic history ever published.” Far from engaging the active historical debate on this topic, he gives scant indication that contrary arguments even exist, such as Peter Temin’s Did Monetary Forces Cause the Great Depression? (Temin’s answer: no.) More than anyone else, Friedman, alongside like-minded economists such as Hernando de Soto, stands as the white knight of The Ascent of Money. Many right wingers tend to minimize Freidman’s subsequent role in advising the Pinochet dictatorship. Ferguson celebrates it. We see the economist counseling the dictator that “the end of inflation,” to be achieved through massive cuts in social spending, “will lead to a rapid expansion of the capital market, which will greatly facilitate the transfer of enterprises and activities still in the hands of the government to the private sector.” Ferguson concedes that University of Chicago-trained economists made a “huge moral gamble” by “getting into bed with a murderous, torturing military dictator.” But this paid off marvelously, at least if you believe that “economic reforms helped pave the way back to a sustainable democracy in Chile”—albeit seventeen years and thirty thousand tortured citizens later. In contrast, those who have benefited tremendously from the Pinochet reforms are the private-pension account managers, whose sky-high fees made their industry one of the most profitable in Chile. The New York Times noted a World Bank study estimating “that a quarter to a third of all contributions paid by a person retiring in 2000 would have gone to pay” these exorbitant commissions. True to form, Ferguson notes some of these problems in passing. But they do nothing to stop him from holding up the private retirement accounts as a model for the world. Ferguson’s abiding confidence notwithstanding, the fate of the Chilean system during the current global financial crisis should serve as a cautionary epilogue: Between October 2007 and October 2008, the country’s already-strained private pension fund lost 26.7 percent of its value, falling from 94.3 billion dollars to 69.1 billion. Perhaps one should not be surprised to see Ferguson championing such economic opinions. He has admitted in the past to being a “confirmed Thatcherite.” In his previous books, he expresses the view that America’s welfare state is a graver threat to its imperial dominance than any external rivals. When making this argument, he has a bad habit of conflating Medicare and Social Security, ignoring that the latter will remain solvent into the foreseeable future. He also fails to mention that skyrocketing Medicare costs might have something to do with the fact that America’s still-private health care system has kept us paying far more in medical costs than the rest of the industrialized world. According to his publicists, The Ascent of Money comes precisely at the right moment, just as the reading public needs a better understanding of the world’s financial workings. Yet the list of public policy prescriptions Ferguson draws from financial history includes not only privatized social security, but also private health accounts, flexible labor markets (read: no unions), elimination of capital controls, monetarist fiscal policies, and a permissive approval of markets’ “creative destruction.” Previously, Ferguson came out as a prominent advocate for the revival of empire in the midst of the greatest neo-imperial catastrophe in decades. He now steps forward as an advocate for unregulated finance even while the world financial system teeters on the edge of the abyss—owing in large part to deregulation. This raises the question: If he is so plainly and disastrously wrong about the pressing topic under consideration, should his work really count as being “timely”? Ultimately, like Ferguson’s imperial histories, The Ascent of Money gives little voice to the victims of a flawed order. One closes the book without much awareness that history’s reckless money managers and profit-hungry financiers do real harm to struggling workers and to the striving middle classes—that far too many people have watched the most fortunate enjoy the “giddy heights” while they experience lives of denial, hardship, and insecurity. To those concerned about the fallout from our current crisis, Ferguson’s conservatism takes the form of reassurance. He soothingly suggests that, for all its rockiness, the present system is for the best, in the same way that empire, whatever its faults, is a force for good. We can only hope that a citizenry now demanding change will have little time for such hollow consolation. Research assistance for this article provided by Sean Nortz. Photo credit: International Students’ Committee / Wikimedia.